Traditional race classification systems, such as those used by the US government, though not without their own bias, identify the following groups: Asian, American Indian or Alaskan Native, Black, Hawaiian Native or Pacific Islander, White, and Unknown. Hispanic is determined by Yes or No application to any of the above groups. The system used in the database is similar to this one, though somewhat more simplified. The sample did not identify any characters of American Indian or Alaskan Native or Hawaiian Native or Pacific Islander classifications. Characters were instead grouped as Asian, Black, Indeterminate, White, or Unknown. The Unknown classification includes ALL humans lacking an image. This decision reflects the lack of distinct racial identifiers in Star Wars prose and the inherent ambiguity of textual claims regarding skin tone and the like. This category also includes imaged characters whose features are completely obscured – such as stormtroopers. The only exception to this ruling is Clone Troopers, whose race is known by virtue of that label. The Indeterminate classification, reflects all humans with imaged features that cannot be immediately and unequivocally determined as Asian, Black, or White. This includes characters who may have intermediate features, who are potentially ‘Hispanic,’ or simply those characters lacking sufficient image resolution to make a strong determination. This is an admittedly subjective classification that will have the consequence of producing lower numbers of Asians, Blacks, or Whites than it would otherwise and lumps all other racial groupings, mixed race individuals, and the like, together. It is entirely possible to apply the labels for race using slightly different criteria and determine different results, but this is inevitable, because racial classification is inherently subjective. This method was chosen to minimize incorrect determinations, and therefore underestimates the Asian, Black, and White categories. This analysis also had to confront the concept of Clone Troopers, a large class of Humans in Star Wars media who are all collectively derived from a single individual of mixed Maori/English descent, Temuera Morrison. I have chosen to consider ‘Clone Trooper’ to be its own race as a function of identity, and therefore clones are considered accordingly. Table 1 indicates the overall representation of Human characters by race across all Star Wars works, as of August 17, 2013. The majority of all Humans are Unknown, faceless characters. Whites represent slightly more than twenty percent of the total and are the largest defined race by an immense margin. The largest defined minority group is that of Clone troopers, roughly five percent of all humans. Asians and Blacks have a representation value that is not significantly different from zero, statistically. The Indeterminate category represents almost twenty percent of all humans and is 39.3% of the proportion of characters who have faces. The upshot of this analysis, represented graphically below, is that Star Wars only bothers to define race roughly half the time (in contrast to gender, which is identified 98.4% of the time in Human characters). When it does define race characters are either obviously White, or of Indeterminate identity 85.4% of the time. Unambiguously minority characters are only 7% of Star Wars Humans, and the majority of these are Clone Troopers. 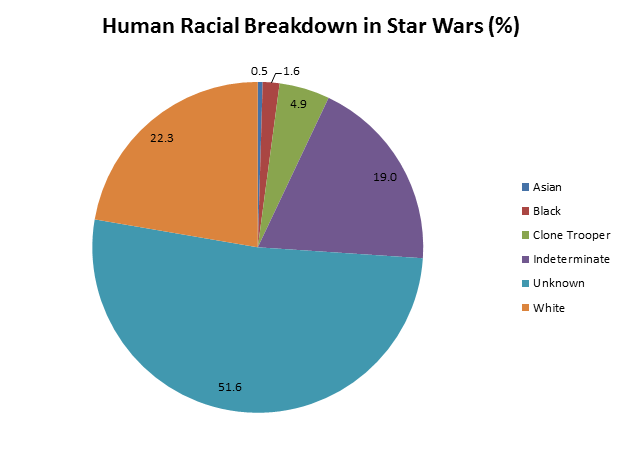 Figure 1: Human racial percentages in all Star Wars works according to random sampling. Margin of error is 4.7%. As a result, conclusions hinge greatly on how the indeterminate category is interpreted. If this category is considered to consist of a large number of Hispanic, Arab, Mixed Race, and other non-White ethnicities, then the Star Wars universe is quite diverse, though very oddly balanced. If the Indeterminate category consists primarily of White persons who are simply presented with poor visual resolution, then the universe is extremely White overall. As a quick example of these varied outcomes, splitting the difference and saying the Indeterminate grouping is half White and half ‘Other Race’ produces the following. In this scenario the Star Wars Human character populace is 66% White and 34% Minority, with a 7% margin of error. This is actually quite close to the current US White, non-Hispanic population of 63% and 37% Minority, though the minority breakdown is very, very different. Why does this seem strange? 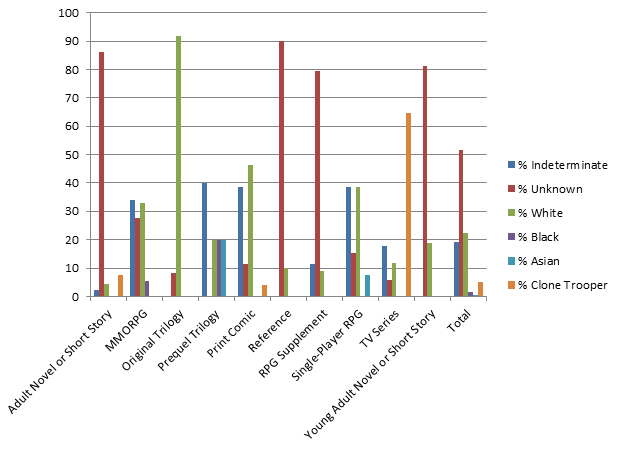 These numbers likely do not match with the impression many fans have of the Star Wars universe, including Mike Cooper’s diversity score metric used for many of the novels. Part II of this article will examine how race classification varies across different source types and what influence this has on the universe as a whole. The sample contains 17 different functional sources for characters, ranging from Movie to TV to Card Games to MMORPGs to Webcomics. These sources do not, by any means, treat race in the same way, and critically the most important source of all, the Original Trilogy of films, is the great outlier, something of portentous impact on Star Wars as a whole, as shall be seen. 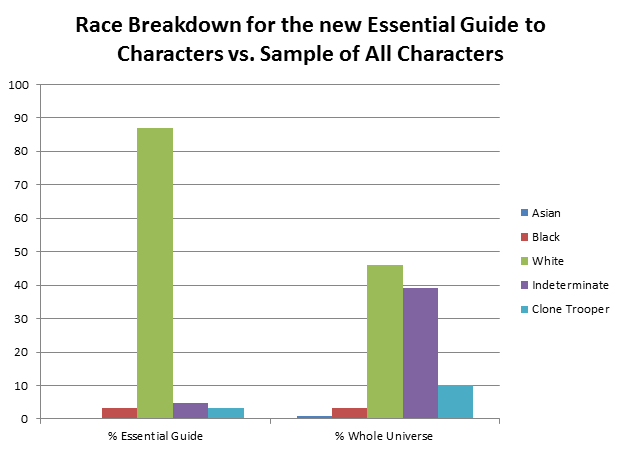 The following figure presents race breakdowns for Human characters from the sample according to media. Figure 2: Race % Breakdown by Source Medium, margin of error is 4.7%. The above figure displays breakdowns for the ten most important formats, discarding those with very small numbers of characters as unable to sustain statistical predictive power. It also compares them to the totals for the entire sample. Even a quick glance shows the tremendous variation across race categories by source. Some key points to follow. Print Sources of all kinds are filled with Unknowns. At least 80% of all humans in all Print Sources are faceless. The lowest number, right at 80, is RPG supplements, which include proportionally more visual imagery, while Novels and Short Stories can only picture characters via cover art. Print sources represent 49% of all humans in the database, but 79% of racially Unknown humans are contained in Print sources. The Movies, as might be expected, have the fewest Unknowns. The only one in the sample is 1047, a Stormtrooper appearing on Tatooine in A New Hope. TV likewise, has very few Unknowns; in this case a single Unidentified Mandalorian is the only Unknown in the sample from The Clone Wars. Comics have slightly more Unknowns, but out of six Unknowns three are characters in full armor and the other three are Conjectural characters that are merely referred to by others. Video games, whether single-player or MMORPG, have a mid-range number of Unknowns. In part this is artificially inflated. 16 out of 26 Unknowns in the MMORPG category are characters with the ‘Pending’ image classification. Presumably the race of these characters will eventually become apparent once images are uploaded. There are also a number of fully-armored characters or conjectural characters (such as those mentioned in the TOR Codex entries) in these settings as well. The two Unknowns from the KOTOR games are both conjectural entries. At 5% of all human characters Clone Troopers represent the largest single, confirmed, minority group in the GFFA. They are not distributed evenly across sources, but this is to be expected, because they are not distributed freely across the Star Wars timeline. Clone Trooper characters cannot appear in either of the Video Game categories, and their numbers are expected to be modest in the categories with a long EU history, where a great proportion of the material was produced before Attack of the Clones was released, or is focused heavily on different eras: this includes all Print sources and Comics. Intriguingly though, Clones are not found in Young Adult works or in the Prequel Trilogy itself based on the sample. The Prequel Trilogy has few clones given any actual roles – merely a handful of commanders in Revenge of the Sith, many of whom first appeared elsewhere. Clone characters are most abundant in TCW, as expected; 52% of all Clone characters originated in that series, and 65% of all humans originating in that series are Clone Troopers. As was previously mentioned, very few characters in Star Wars classify as traditional minorities. The overwhelming majority of non-white candidates are Indeterminate or Clone Troopers. Only a very small number of Blacks, 7, and Asians, 2, were present in the sample. As these numbers are so small in absolute terms they are highly vulnerable to sampling error. Even so, it is worthwhile to look at the distribution of these two groups by source. There are two Asian characters in the sample. One is Sei Taria, aide to Chancellor Valorum who appears in the background of several scenes of The Phantom Menace. The other is Gegorran, a merchant character from Knights of the Old Republic II. This character is the in-game representation of the Asian character face option available for a male Jedi Exile player character. The takeaway message is that there are essentially zero Asians in the GFFA. From an out-of-universe perspective Asian characters did not exist at all until the Prequels were released. Out of seven Black characters in the sample, six occur in video games. Five are characters in The Old Republic, which is why the MMORPG category is one of only two that has measurable Black representation. The other is Olin Garn, a character in X-Wing Alliance, a simulator. The Simulator category was excluded from this analysis because the sample size, 2 characters in total, was too small. The final Black character is Mace Windu, representing the Prequels, and also by far the most noteworthy character from the franchise captured by the sample as a whole. The data here mostly reveals a commitment by TOR – one apparently not matched by Galaxies – to display unambiguously Black characters in the product. Remove that source, and Black characters return to effectively zero presence in the Star Wars galaxy. The overwhelming majority of humans created by the novels are faceless. The largest group in possession of race data is the Clone Troopers. Additionally, two of the White characters in the sample are themselves clones (of Jaden Korr and Soontir Fel respectively) and that is the means by which their race is established. The novels simply are not concerned with appending race to characters they create. The second largest source of Human characters (tied with the novels at 94) are the MMORPGs Galaxies and TOR. This is also the most systemically diverse category, though it is also subject to the greatest amount of revision as the number of Unknowns falls with additional uploading. Indeterminate characters are very high in this category, which is a likely consequence of digital rendering and the modeling used. TOR in particular commonly mixes complexions and features to create racially ambiguous face models. This result is quite possibly the starkest of all those sources examined, though it is based on a mere 12 characters so it should be taken with caution. The OT is, essentially, an entirely white construct. The only non-white character is an Unknown stormtrooper. The percentage of white characters is double that of the next highest category, the comics, and in stark opposition to every other grouping. The impact of this on the franchise as a whole is immense, since the majority of the most famous characters in the GFFA originate in the OT or are the direct descendants of OT characters. Worth noting, the characters in the sample are largely not well known (Derek ‘Hobbie’ Klivian is the most significant), and therefore represent the backdrop as well as the leads. The sample captured only five humans from the Prequel Trilogy, and as such this datapoint, which implies extraordinary diversity, is extremely subjective and should not be taken as supporting strong suppositions. If nothing else, however, it reveals an immense contrast with the Original Trilogy. Comics represent a fairly large number of human characters with few Unknowns (only 11.5%) and are therefore very interesting as a datapoint. However, they also include no obviously Black or Asian characters, despite a very high percentage of indeterminate characters. This is largely a consequence of shading, style, color palette, and other factors that obscure faces and profiles of characters, leaving little detail. The ten humans in the sample created by Reference works are largely faceless, though the one who is pictured happens to be White. RPG supplements are the third-largest source of human characters in the sample. They are predominantly Unknown faceless entities, but there are some White and Indeterminate characters as well. Many of the latter include grayscale drawings present in older WEG materials that never received color. As such, it can be said that there was no deliberate effort to depict non-white characters in these sources. Out of 13 humans sampled from the KOTOR games, there are a number of Indeterminate characters, one clearly Asian character, and five clearly white characters. The Indeterminate characters include characters appearing via holoimage or with mostly hidden faces, but also truly race-ambiguous individuals. 65% of the humans created for TCW are Clone Troopers. There are very few others, and most have their faces fully or partially obscured. The great majority of humans produced for Young Reader works are, like their adult equivalents, faceless entities. The three who are identified as being White are all from the Jedi Prince series and are all Empire affiliated. Overall a small majority of Star Wars humans are faceless and therefore race-less entities. Out of the remainder these are roughly split between those who are White and those who are not necessarily White. The only truly identifiable minority group is that of Clone Troopers, who register as 5% of the total. Other discernible minorities have a negligible presence in the setting. The various Print media, novels, references, RPG supplements, etc. have little to say on the race issue, with the overwhelming majority of their characters being faceless. However, when those characters are identified (usually through cover art or possibly an image in another source later on) they tend to be defined as White. Primarily visual media in the EU, the Comics, Video Games, and TV, are much more diverse, with numerous characters that are Indeterminate, and accounting for the majority of those few definitively minority characters, including the Clone Troopers. The Prequel Trilogy is superficially diverse, but in point of fact simply does not introduce any large number of Human characters to the franchise. The Original Trilogy is the Whitest point in Star Wars history, and as such has an outsize impact on the racial breakdown of the series as a whole. This effect will be examined further in part III. The sample database I developed uses Wookieepedia entries for all characters in the Star Wars universe. These characters stretch across hundreds of sources and many media. They also include everyone who shows up in the universe. The sample includes famous characters such as Mace Windu and Darth Krayt, but it includes far more minor entities such as ‘Unidentified Kage warrior 3’ and ‘Eker.’ The latter grouping dominates the database, and in terms of pure numbers, dominates the galaxy. But they are not the beings we see and know. This is a smaller and much more subjective grouping, the ‘Major Characters.’ The question is, who are these characters, and equally important, how do they compare with the backdrop. Additionally, when this grouping varies from the background, why do they do so, and what does it mean. These critical sets of questions, and how they matter towards portrayals of race in Star Wars, are the subject of this analysis. The tricky question is how to define major characters. This is an incredibly subjective process and one that, undertaken by any individual, is bound to be controversial and subject to accusations of massaging the data. In the effort to produce a list with at least some measure of editorial imprimatur, I chose as a sample of major characters the individual entries in The New Essential Guide to Characters. Removing the droids and group examinations (i.e. The Jedi Council), this yields a list of 94 characters (counting the Daragons and Lars as a single individual) that can be subjected to analysis. Obviously this is not a perfect list. The New Essential Guide to Characters is over ten years old and as a consequence misses out on whole spectra of media, most notably in the Video Game category. The twenty percent of Star Wars characters who appear in MMOs are not represented here at all. Regrettably though the revised version of this reference seems irreparably delayed, and therefore I have to make do with this. Deviations between this group of major characters and the whole appear immediately. 66.0% of Essential Guide characters are Human, compared with only 42.6% in the sample. Movie characters account for only 4.6% of the sample, but 48% of the Essential Guide’s. Video Game characters account for 26.8% of the sample, but only 2% of the Essential Guide’s (Kyle Katarn and Jerec). This is obviously vastly different from the overall sample values. Most notably, it includes zero Unknowns. A direct comparison with the Sample thereby means using percentages of Humans by race for the knowns only. This increases the error, but the results are too visually striking to ignore. Figure 3: Percentages of humans by race for individual entries in the New Essential Guide to Characters vs. a random sample of humans from all Star Wars works (known racial identities only). Clearly the ‘Major Characters,’ if the Essential Guide’s representation is at all accurate, are considerably more White-dominated, as well as more Human-dominated, than the setting as a whole. The next question is where did these 54 White Humans, among the most important characters in the entire setting (ex. this group includes all Skywalkers and Solos excepting Ben Skywalker), come from. 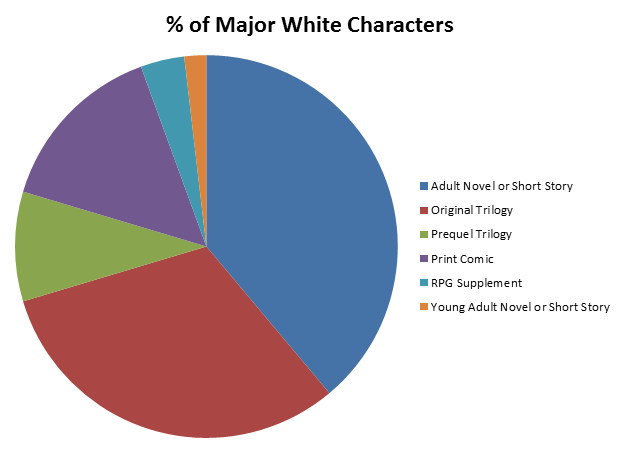 Figure 4: Origin breakdown, by percentage, of the 54 White Human characters given individual entries in The New Essential Guide to Characters. The answer is quite clear: The Original Trilogy, and the Adult Novels (“novels” in this case refers mostly to the Bantam Era, given that the Del Rey period had only just begun when the New Essential Guide to Characters was published). The influence of the Original Trilogy grows even greater when considering that of the 23 White novel characters in this group 2 are the direct offspring of White Movie characters (Jacen and Jaina Solo), 5 are the love interests of White movie characters (Callista, Prince Isolder, Mara Jade Skywalker, Bria Tharen, and Gaeriel Captison), and 1 is the blood relative of a White movie character (Gavin Darklighter). As was seen previously the Original Trilogy is the least diverse of character sources in Star Wars. At the same time it is also the second most important source of major characters to the franchise as a whole. As such the Star Wars universe’s racial composition is heavily determined by the impact of its oldest and least diverse element. The distorts the picture of a franchise that could otherwise be seen as having a rather progressive, if admittedly strangely oriented, portrayal of race among its characters. I’m going to go ahead and admit that my coffee is still kicking in but I did have a few questions/points. 1. The amount of work/effort you put into this is incredible and I do applaud you for that. 2. I’m looking at the database that you used and while it does appear to be a random sample, I’m wondering if maybe a random sample and if using only characters with pictures might not be the most accurate indicator. For example, Kelvan from Razor’s Edge doesn’t have any official art but is definitely described as being black within the text. 4. An overall view of the galaxy is interesting but I still think that the race main/supporting characters within a story (whether it be film, comic, book, game, or other) is more important to the overall diversity. It would be interesting to see what these numbers end up being if you include the entire galaxy but that would be a ridiculous project. 5. I’m a bit confused by something: in the last section, you mention a lot of main characters like the Skywalkers and the Solos etc etc but in the section where you talk about the Black and Asian characters, Lando isn’t included amongst them and neither are some other characters that I can think of off the top of my head who have fairly large roles within the SWEU. I’m curious as to why Lando (at the very least) wasn’t included. I know I didn’t see him in the database but I also didn’t see a lot of the characters who you mentioned in the last section. Just to clarify, I’m not attacking or anything! I totally respect what you’ve done here with all of this. These are just some barely-caffeinated musings. I’ll let Michael go into more detail, but it seems like Lando is there in the data, even if he doesn’t call him out specifically–Table 3 says the EG is 3.2% black, which I’m assuming is Mace and Lando; I could be wrong. He’s not mentioned in the “Distribution of Blacks and Asians” section because that’s specifically derived from the database, which just happened to include Mace, but not Lando. I think I can address most of these questions. 1. Thank you, this took a lot of effort to do. 2. There may be some small portion of print only characters who have defined race in the text of certain print works, or who could, at a minimum, be differentiated as ‘White’ vs. ‘Indeterminate.’ However, there was no real way for me to do that, I made the racial classifications based on an image or images stored on the Wookieepedia pages of the relevant characters. Going into the individual sources for each character would have taken too long and in many cases required media I simply don’t have access to (like Galaxies). 3. There will be a lot of characters who are unknown regardless though. Many characters exist as nothing more than callsigns, conjectural references, or are only shown wearing full armor or other outfits that obscure their features. It also is not uncommon for even very significant characters to not have textual clues. Rachele Ree, from Scoundrels, who is in the sample, has a major role in that novel, but has no descriptive text whatsoever (I recall looking very hard when that book came out). 4. Well, you could of course do a racial breakdown using these same categories for any individual work and compare it, but the trick is, aside from the largest works (ie. big video games, whole comic series runs, etc.) the sample size is simply going to be too small to say anything statistically. 5. Lando and Mace Windu are the two black characters included in the New Essential Guide to Characters, so they’re that 3.2% in Table 3. The Indeterminates in that grouping are Boba Fett, Jango Fett, and Captain Panaka. Mace is in the sample, just by random happenstance, I mentioned him there simply as a notation that the sample is not composed entirely of minor characters. And, I’m totally happy to take any and all comments on this subject and explain people’s questions, there’s obviously a lot of material there, so please feel free to ask. For Jango and Boba Fett and all their clonetrooper brethren I would suggest categorizing them as Pacific Islander since well, that’s what their actors are…at least as established in the PT. Pacific Islanders are usually lumped in with the “other” group or with Asians so it’s actually quite a feat that Star Wars has these distinct Pacific Islander characters. There are some issues around the concept of the Republic mass producing expendable clones who are men of color and throwing them at the front lines with predominantly white Jedi generals (for example, it replicates the history of the US military and the use of white officers and soldiers of color…) But the fact remains that Star Wars is one of the few science fiction and fantasy franchises to have a high profile Pacific Islander character (the only other one I can think of is Power Rangers.) If Disney does eventually make a Boba Fett film (hopefully they would cast Daniel Logan or another Maori actor) then it might be the highest profile role for any Pacific Islander actor in Hollywood to date. I don’t know if I agree with the argument that Star Wars should always reflect the demographics of the United States (which is not the argument being made here, but the comparison of the demographics in Star Wars versus the US was brought up.) Here’s why: First of all, the demographics of the modern United States did not occur out of a vacuum, the demographics of the modern United States are the result of colonialism, genocide, slavery, selective immigration, etc and I’d hope that the same thing didn’t happen in Star Wars to human people of color. Secondly, we know that is an imperfect metric–even if Star Wars racially met these numbers it doesn’t meet it with gender, etc. If this was an expected goal we would surely see more women. Furthermore, if we use the demographics of the United States as a standard or as an explanation we basically lock certain groups into guaranteed minority status when the demographics of the United States has far less to do with a Star Wars character’s racial make up than does an author’s creative license. Hugh Quarshie may be of Ghanian descent, but he is also of English and Dutch descent. He’s mixed race, and that was one of the points behind that classification – I wanted to represent anyone who was even possibly mixed race as such, rather than lumping them together (so, for the record, I would have classified President Obama as ‘Indeterminate’ based on the criteria I used). Given how unusual it is to actually have any real knowledge regarding the pedigree of a character in-universe I deliberately made that classification very broad in order to make those judgment calls I had to make (ex. Theron Shan is in the sample) inclusive rather than exclusive. As to comparisons with US demography, well Star Wars is, ultimately an American franchise. Created and produced by Americans and owned by an American company. If one if to make value judgments about whether representation qualifies as ‘good’ or ‘bad,’ then it has to be done comparatively against some baseline value. While the US demographic stats are an incredibly arbitrary value to organize a fantasy universe against, it seems to make more sense to compare Star Wars to those values than, say, global demographic statistics. Regarding your mention of my Diversity Scoring system, I would point out that while it’s a totally different, far more subjective metric, the average book score at this point is 68—meaning the average book cast in our “sample” is 32% white human men, which is indeed worse than the sample but still way better than the NEGtC. What’s interesting about that to me, and this is something I’d love to see you deal with in a future article, is that my 32% figure is specifically men (straight men, technically, but that’s a whole different topic), from which one could then extrapolate that there must be a roughly equal number of white women out there who just aren’t “important” enough to be Dramatis Personae characters. Looking through the database myself, there appear to be 75 WHMs out of 95 white humans, meaning that the total sample is 7.5% white human men. Now, if this were my DP-based system (or the Essential Guide, for that matter), I could take that 7.5 and assume that the GFFA overall is therefore 15% white humans, but since the sample is ostensibly representative of the total galactic population, that doesn’t work. Which leads me to believe that no database of extant characters could ever really be representative, because we’ll always be dealing with a population that’s unnaturally weighted to males over females—almost 4:1 in the case of WHMs. I can’t begin to imagine how one would compensate for something like that. I think perhaps we are neglecting some of the simple historical realities of the filming of the movies. Star Wars was first filmed mainly in England — so yes, there are going to be a lot of white folks, especially given that no military had active duty women in combat roles, and quite a bit of the story takes place in a giant active duty battle station. It’s also why the Empire sounds British. In the prequel trilogy, you have filming done in Australia, so it makes total sense that there will be an increase in Pacific Islander ethnicity or Asian – that’s the reality of Australia. Sometimes I wonder if we don’t make too big a deal of this, though, because “race” as we think of it is a social construct. Think about it – “Pacific Islander” — what meaning would that category even have in the Star Wars Universe — and how would we ever expect it to be applied to the books? Also, some of this is due to sample size. The protagonists will end up skewing the numbers, because chances are they are going to be dealing with people of their own race. If you read the short story about Greedo in Tales from the Mos Eisley Cantina – you see a lot more Rodians than you do in any other story — because that’s what makes sense for the main character. If we had stories focusing on the Duros or what have you – there’d be more Duros. How can we get a good sample size of mixing when our viewing begins in the middle of an Empire that has an strong “anti-alien bias” (which, is ironically, a very human-centric statement)? If the powers that be force non-humans to hide and not mix, it’s hard to do a universal demographic study by mere observation. In this sense, I think looking at the Legacy Comics or even the Jedi Temple in comics might be a better way to get a sense of the demographics. Though I would also like to see less Anglo-Saxon looking people in Star Wars, that is only if it makes sense in-universe. I don’t want to see more genetic diversity for the sake of genetic diversity. Diversity is not a measure of how “progressive” a story is. Star Wars is not Earth. Unlike Earth, the Star Wars galaxy seems to have a “Caucasian” human majority. So? It was filmed primarily in Britain, the US, Tunisia, Norway, and Australia, countries where Caucasians are a majority. It makes sense. Race is largely an American obsession, due to that country having been a refuge for people from all over the world when it had been established as an Anglo-Saxon-dominated land taken from a genetically and culturally alien people and relying on slave labor. Where I come from, nationality, as understood within the parameters of the nation state, is far more important than race.